Our first ever RND 5050 game comes from the library of the glorious Amstrad CPC. This machine was like ZX Spectrum`s mature brother: similar architecture but more solid execution. The only CPC versions of the game we could find are in French and Spanish - hard to tell if there was even an English one at all. No matter...let`s just hope it`s not a text adventure. ...complete with steamship pier, armoury, train station...and that little circle inside a bigger one is Luke`s hat. After a bit of running around and clicking on things we manage to get a "mission", then something involving "le bandit" happens at the pier and then we board the train. Cue the next scene - The Shootout. 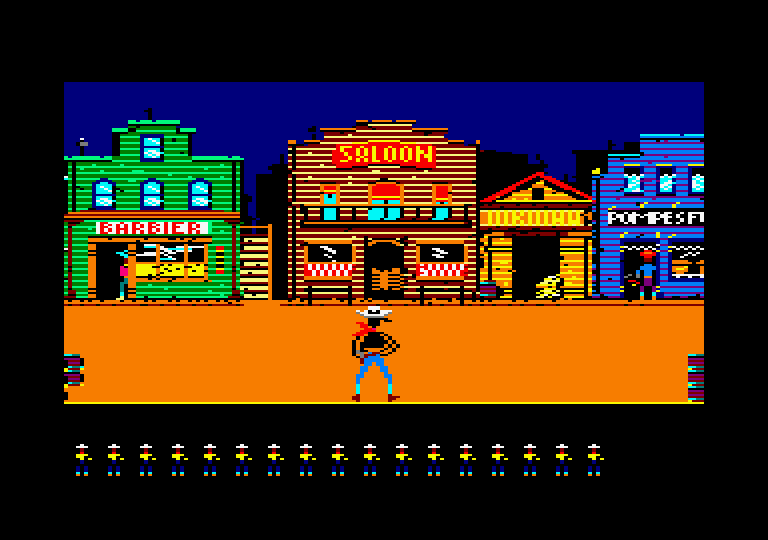 Here Luke blasts away at assorted banditos popping up here and there- aiming consists of lining your character against the enemy, nothing fancy. It`s best to keep to either left or right side of the screen and ignore faraway targets whose bullets seem to have limited range. After clearing this stage you move into a similar setup, this time in a saloon - or so we presume, since unfortuantely this is where the game gets buggy and gfx become a mess. It`s still possible to play though but after we got through this stage a score appeared...and after answering a Y/N question (in French) the shootout restarts. Seems that`s it then...or is it? Well, no, since after checking it out on MobyGames it turns out to be quite an advanced multi-genre title. After the shooting, there are adventure and puzzle stages - however that seems best experienced on other platforms (DOS, ATARI ST, C64 and Thomson) - here gfx and translation problems make further investigation rather pointless. Overall, quite an impressive title, varied gameplay with charming graphics - well worth trying out, though maybe not in CPC emulation mode. Unknown game, unknown system. Great! At least the title is familiar, Arkham Manor residents are true hobos at heart. First of all, let`s see about that Arcadia thingy - seems to be a 2nd gen 8-bit console that enjoyed a brief run in the early Eighties with 35 games released. 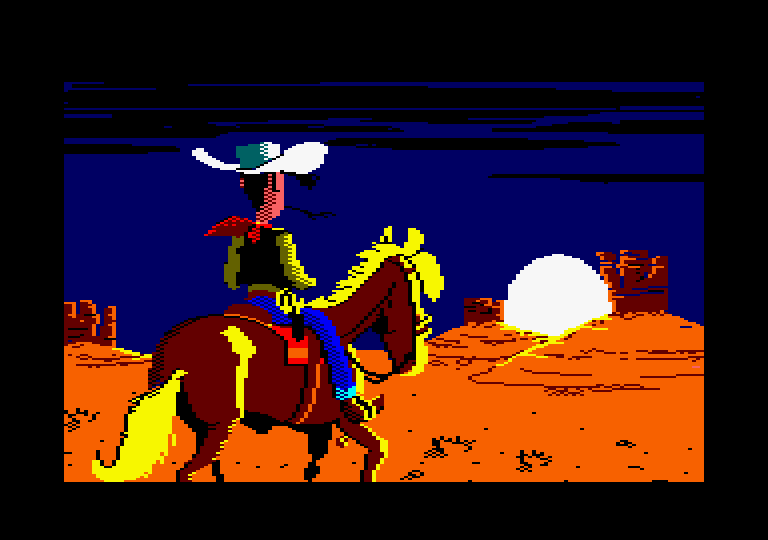 The game itself starts up fine on WinArcadia emulator - cue the nice start up screen seen above (yep, the original resolution was 128 x 208). Controls are bit quirky since the original "pads" were joysticks with some numerical pads attached and are all over the place in the emu. Choosing a game "mode" is a bit hit and miss with these controls - but eventually we played through what we think is the "main" game. The titular Hobo tries to reach his "home" at Grand Central Station - but, like in reality, it`s not so easy. 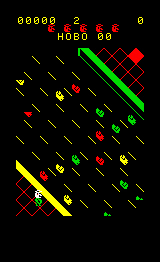 First up is the Frogger-like cross-the-street stage. The trick here is to dash in between tiny space between the lanes...this can be rather difficult, given their diagonal slant. Difficult, but not impossible, and after a while we eventually reach Stage 2 - some sort of security wall patrolled by guards. 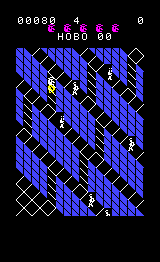 This one is pretty hard too - maybe even worse than the first since controls are pretty awful - you can`t go down ladders and jumping (over guards) is not very precise. 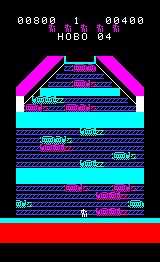 If you manage to navigate the wall succesfully you arrive at the station itself - this one is similar to Stage One only this time you try to crass by jumping from train to train and onto platforms. This stage is pretty cool, and thankfully horizontal, not diagonal - although after a while it all blurs together and we were very lucky to reach our - presumably cardboard - abode. 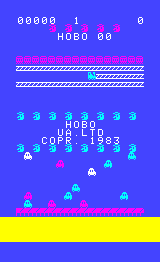 Hobo, despite sometimes awkward controls, is a good game - has plenty of heart, decent graphics and is quite varied for its time. And the protagonist is quite charming too. Recommended! Emulating the Archimedes isn`t as straighforward as any ol` console - but after a brief struggle we prevailed (recommended free emulator: RPCEmu). Bizarrely, it has no "take screenshot" option - rather unusual, good old PrtSc has to do instead. 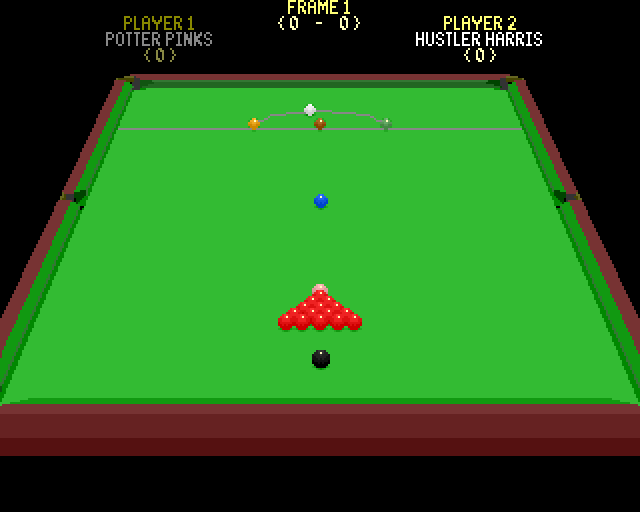 As for the game itself, no surprises here - it`s a snooker sim. Not exactly our favourite genre here at AM, but no matter. 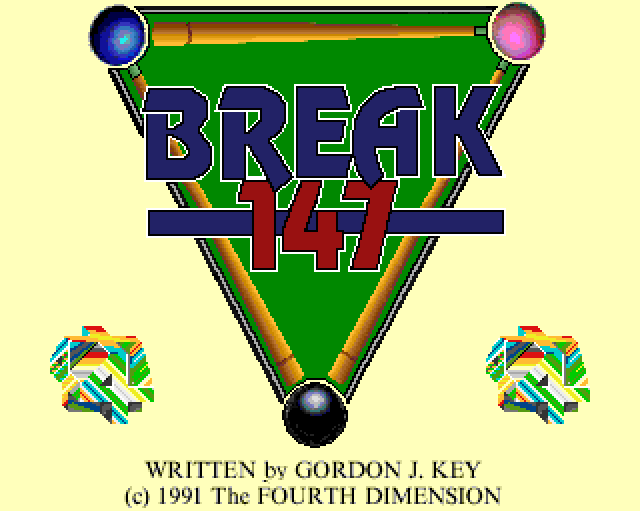 Break 147 is a 3D title and it looks and moves pretty slick - ARM processors were quite powerful. Soon as we attempt to line some shots, a major problem transpires though - the controls. Majority of the operations rely on the mouse, responsible both for the view adjustments and cue stick control. Admittedly, since we`re emulating it`s hard to say if there was the same problem in the original version. Also, perhaps we missed some option to adjust this (lock down of sorts?) ...without the manual it`s impossible to establish though. Or...maybe we`re just rubbish at it and our mouse needs cleaning. Therefore, a promising, good looking game rendered unplayable by control trouble. Shame! 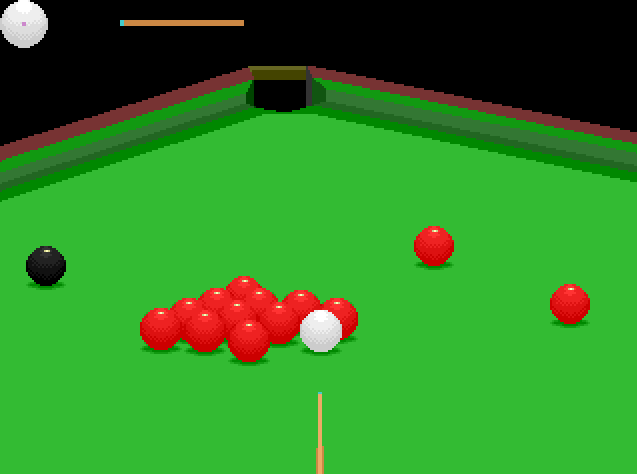 Perhaps others would have more luck though, snooker fans should give Break 147 a go none the less.